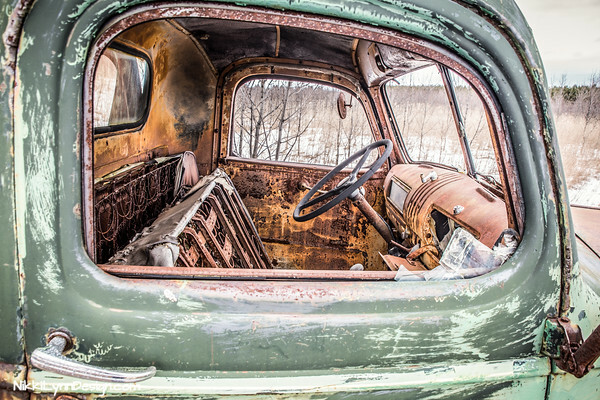 There are also vehicles from additional travels outside of the Midwest but for the majority of the photography, the subjects are Midwestern states. 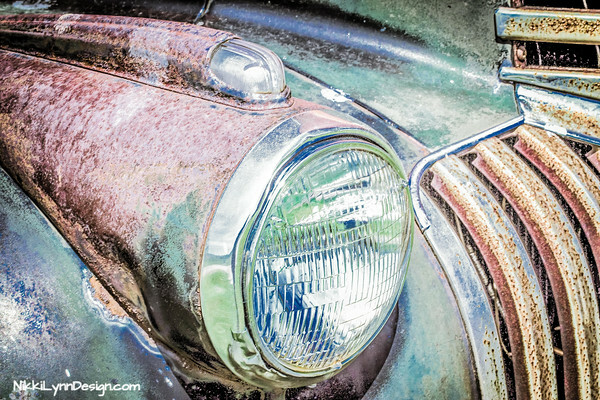 Traveling the backroads of Wisconsin will yield some pretty sweet old history. Many of which, have just become yard art. Titled “Autumn Pleasure” because it was the perfect day and the perfect to spot to stumble across this beauty! 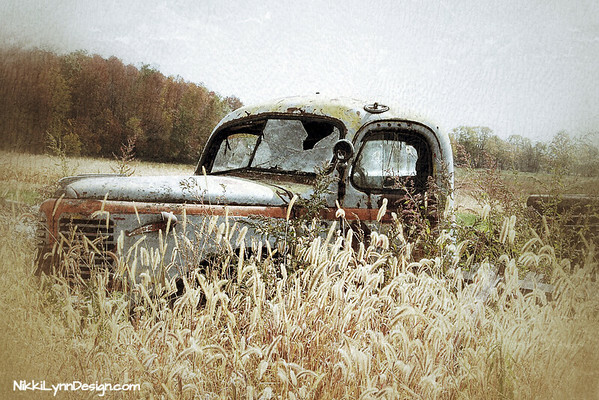 Hidden in the tall reeds of a farm field in Wisconsin with the late autumn tree backdrop. Pretty much the last nice day of fall 2014. 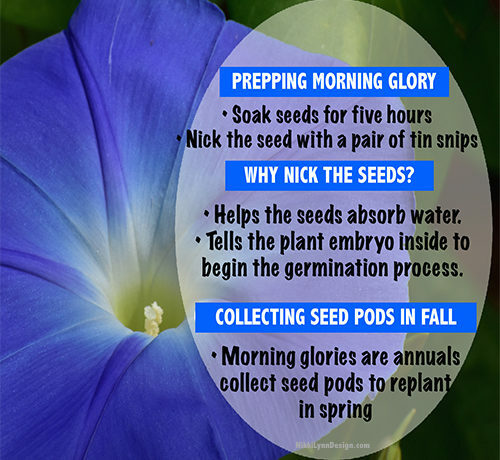 Before winter set in. 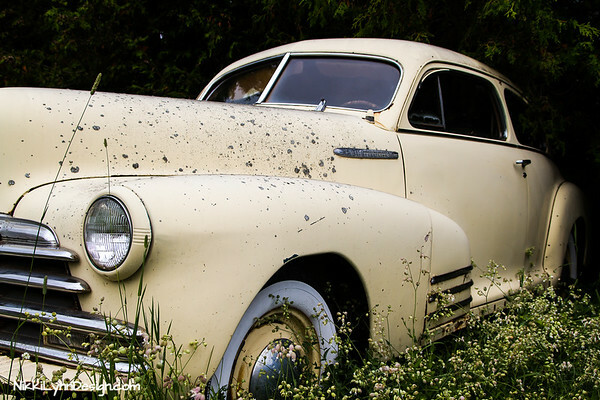 The Old Chevrolet Fleetline Automobile made up over 71% of Chevy sales back in the day. 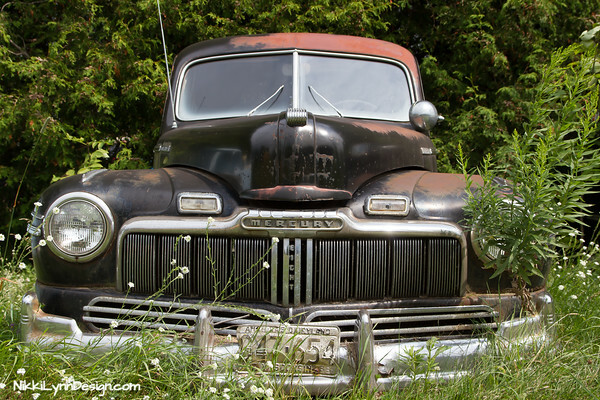 Today, I got a chance to photograph this Fleetline with the landowner’s permission. 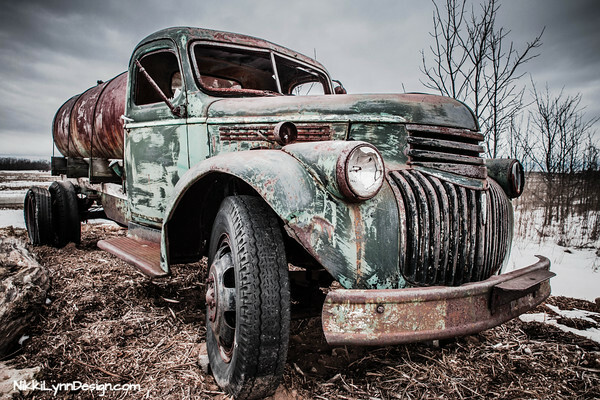 I noticed that there was an old junkyard full of vintage vehicles on private property. Truth be told, I remembered it was there from my teen years. Thought I would see if it was still there. 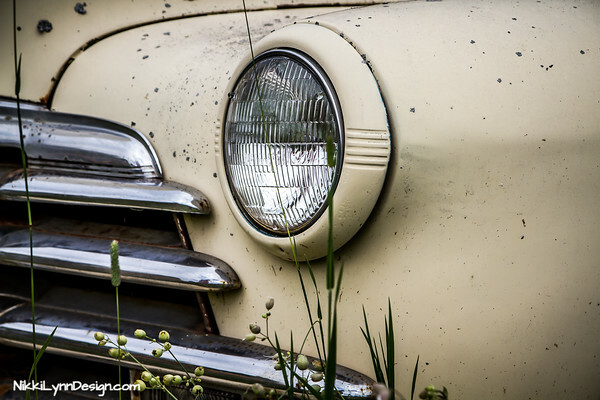 Almost all the classic cars are fully covered in grass and vines. 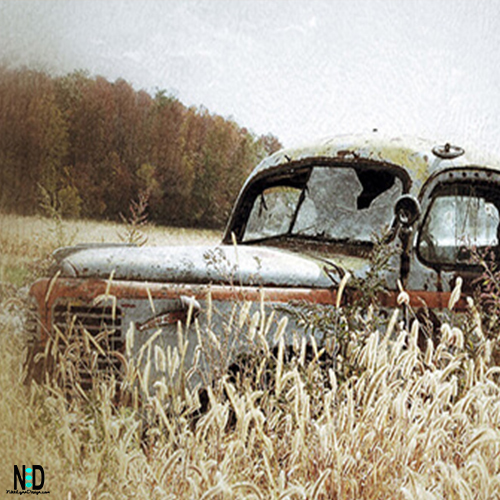 The grass was overpowering most of the vehicles. I was able to see a few and that was enough for me to pay a visit to the front door of the landowner. Apparently, I wasn’t the only one the had stopped off over the years. Another photographer had as well. The landowner wishes for the location not to be disclosed. The last time someone photographed they had people calling and inquiring about parts. The owners are not interested in selling off parts, or the cars. I really appreciate the landowner for allowing me access to the land and also for the wonderful stories she told me about a few of the cars. The Jacquelyn Nicole Tugboat docked along the bay in Sturgeon Bay. The historic Sturgeon Bay, Wisconsin steel bridge and Bay Ship makes up the background of the photo. 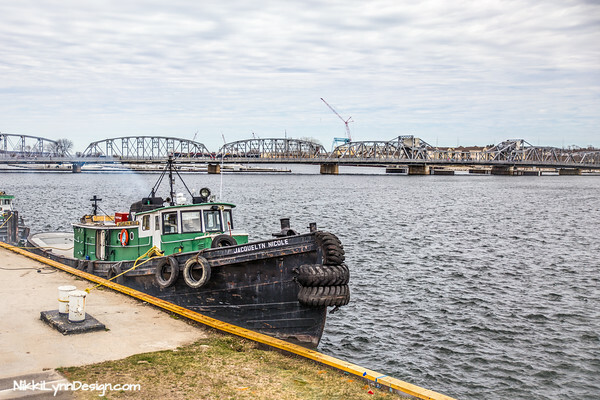 Tugboats line the shores between the two bridges in Sturgeon Bay, Wisconsin. You never know what tugs or large ships will be passing through. The Jacquelyn Nicole is about to embark on another venture on Lake Michigan. 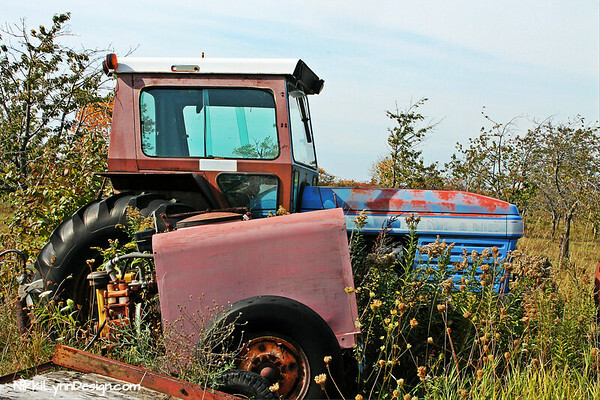 This retired tractor has a wonderful story. The tractor once was a great workhouse for a busy Door County, WI cherry orchard. Now, both the tractor and the orchard have been retired. 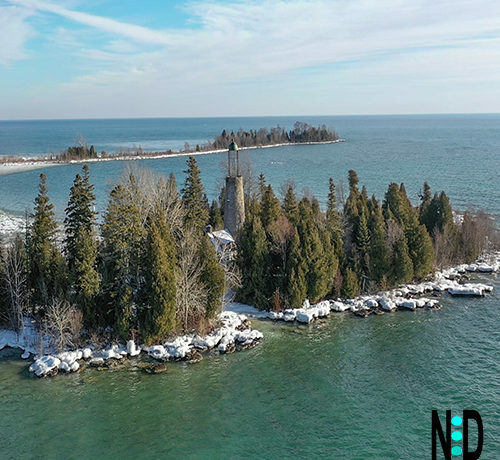 You can see all the items on this property by reading Honey House Door County. 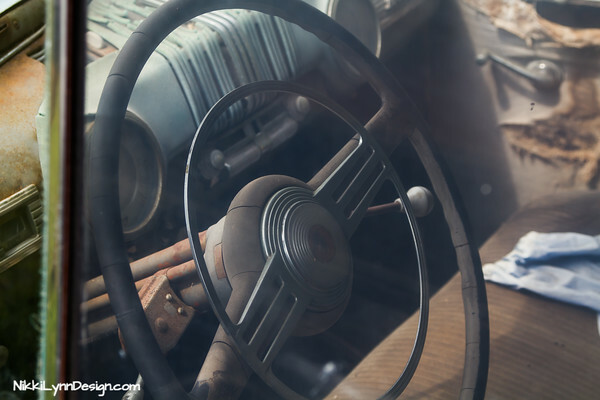 The Mercury Eight was the first model of the Ford Motor Company’s Mercury Marque and was produced from 1939 through the 1951 model years. It was the only model offered by Mercury until the Marque starting producing multiple series in the 1952 model year, at which point it was dropped as a model designation. 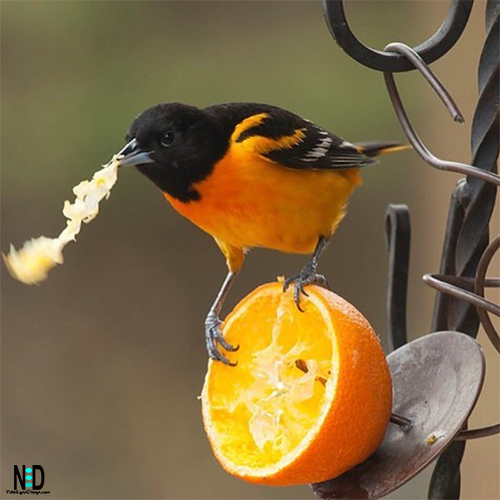 Photo Taken in Door County, WI. I’d like to believe I am in tune with my surroundings but this treasure proved me wrong. I’ve passed it 100″s of times every year. But, I have never taken note before today. Strange. Something in plain sight. Yet, I missed it. Daily, weekly, monthly and even yearly. If the owner would not have told me how long it had been sitting in the field, I would never have believed someone wasn’t playing a trick on me. A treasure from the past that I unmistakably passed without noticing. Just another old find. 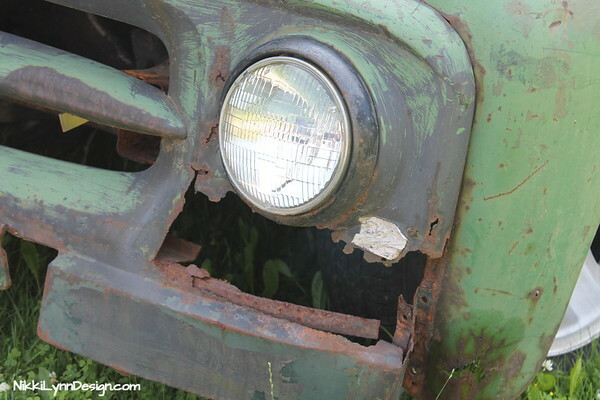 I love all Wisconsin has to offer me to feed my rusty, dusty and old relics hunting. The SS Calumet freighter is in the bulk freighter class. Bulk freighters carry unpackaged bulk cargo like grain, coal, cement, and iron ore. The Calumet has an interesting past. 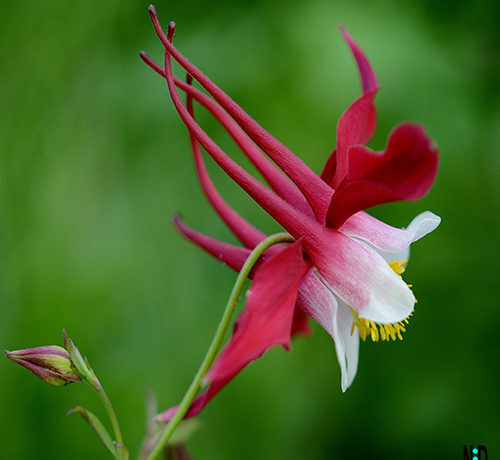 It was sold three times and named four, since 1973. 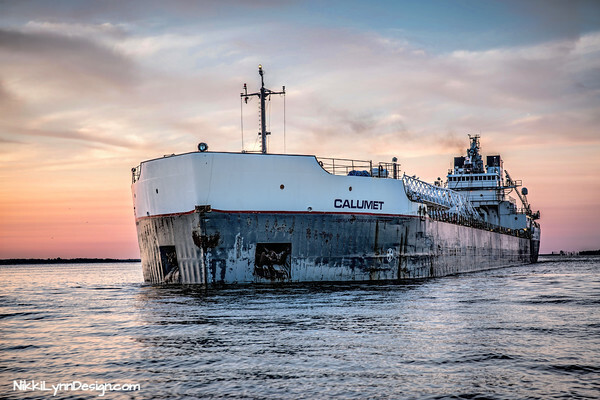 The SS Calumet was built in 1973 by the American Ship Building Company in Lorain, Ohio as the William R. Roesch for the Union Commerce Bank, Ohio, and managed by Kinsman Marine Transit. 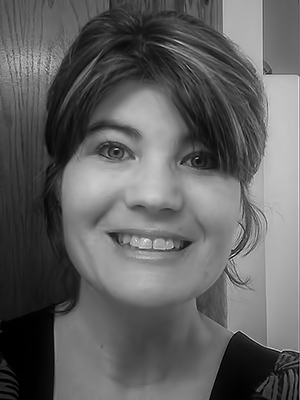 In 1994, she was transferred to Oglebay-Norton. She was renamed David Z. Norton, after company founder David Zadock Norton on March 31, 1995. In 2006, Oglebay-Norton sold its fleet of River class ships to Grand River Navigation. The Norton was renamed David Z.. The ship was sold to Rand Logistics in 2008, being renamed Calumet, after the original Calumet, built in 1929 for US Steel, which was scrapped in 2007. I captured her at sunset on a warm summer night. Just as she was pulling into the Port of Green Bay, Wisconsin to offload. Traveling the country roads from one state park to another on a recent trip to Tennessee, we came upon a bus graveyard. I could see many of the buses from the roadway and the grounds have clearly marked no trespassing. 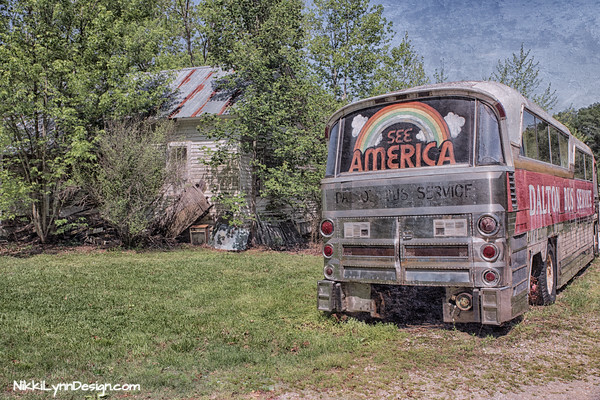 There was one place that really caught my attention, the see America bus. We pulled over and I shot this from the road. The perfect message right here. You can see small pieces of America, one road trip at a time. For myself, life is all about adventure and I am just along for the ride. Following the Civil War, more and more tourists flocked to the sites of these famous battles. The problem was getting to the top of Lookout Mountain. It was a four-hour horse and buggy to get to the top. 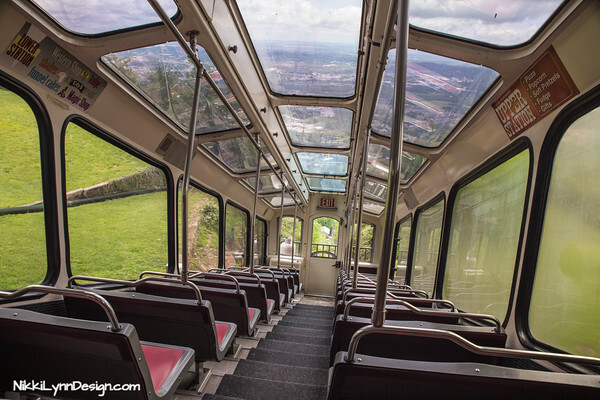 In November of 1895, a passenger railway known as “The Incline” opened to easily whisk visitors up and down the steepest part of Lookout Mountain. John Crass and the Lookout Mountain Incline Railway Company, built an incline at a grade of 72.7%, making it one of the steepest passenger railways in the world. The original coal-burning steam engines were replaced by two 100-horsepower motors in 1911. Other than that, the railway hasn’t changed much in over 100 years of operation. Do you have an obsession with something? 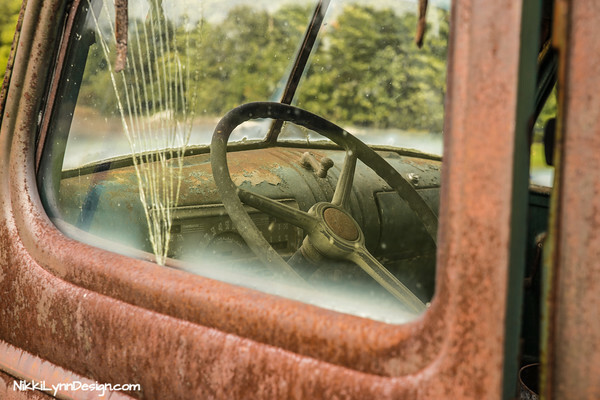 For me, I have an obsession with rust – something old, something rusty, something with history and a story. I find myself drawn to items that you can look at or picked up and imagine a person using. What was life like back at the time this item was used? What challenges did the people face? I focus on how time changes items and the steps the world has maybe made for the better, or for the worse. Depending on how one looks at the item. 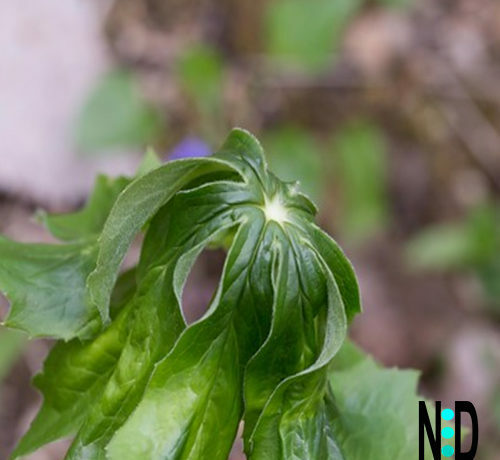 CLUE: Farming has always been a large part of Wisconsin’s history. 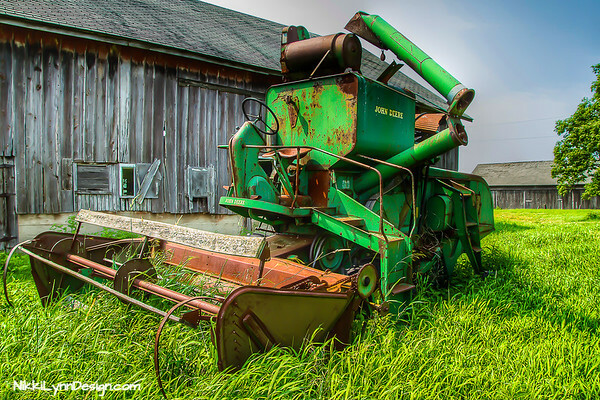 John Deere Combine behind a barn in Wisconsin. 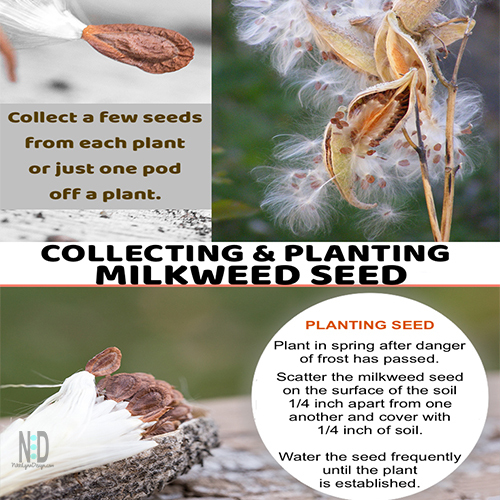 The wonderful thing about winter is the barebone landscapes – with no leaves on the trees you get a chance to see things hidden throughout the remainder of the year. Apparently, this is the bus boneyard. 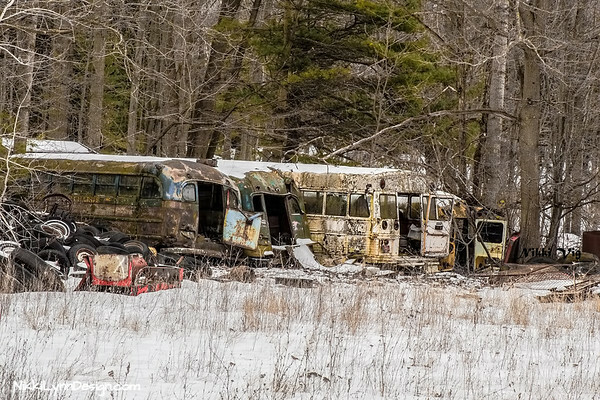 Where old school buses go as their final resting place. 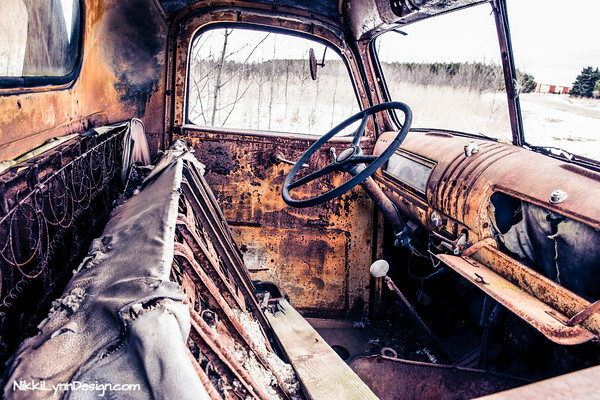 Interior of an old truck on a back road in Wisconsin. 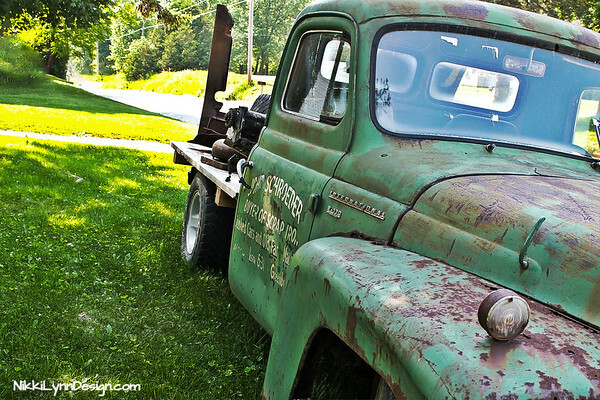 The seat springs of this truck blew me away, they were something to focus in on. A little wider shot of the truck that inside of the truck that is pictured above. The full view of the truck that the two previous inside pics were taken of. 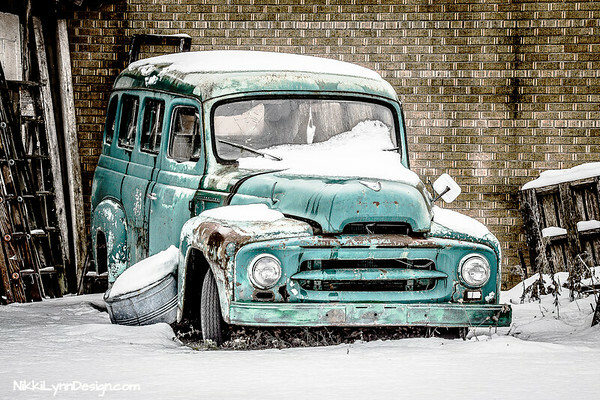 Traveling the backroads of Wisconsin always yields some really fun relics to photograph. Another beauty spotted in a rural farm field in Wisconsin. Yep, the owner provided access and I tested the horn – yep, it still works. The international truck serves as an automobile towing machine.